Ymir har sin opprinnelse fra den Norrøne skapelseshistorien. Navnet staves også Yme eller Ymer. Ymir er urjotnen i den Norrøne mytologien. Under er to versjoner av historien som beskriver hvordan Odin og brødrene hans Vilje og Ve drepte Ymir og skapte den synlige verden av hans kropp. Havet vi seiler på er blodet fra Ymir. As the ice dripped more, it formed a cow, and from her teats flowed four rivers of milk that fed Ymir. The cow fed on the salt of the rime ice, and as she licked a man’s head began to emerge. By the end of the third day of her licking, the whole man had emerged, and his name was Buri. He had a son named Bor, who married Bestla, a daughter of one of the giants. Bor and Bestla had three sons, one of whom was Odin, the most powerful of the gods. Ymir was a frost-giant, but not a god, and eventually he turned to evil. After a struggle between the giant and the young gods, Bor’s three sons killed Ymir. So much blood flowed from his wounds that all the frost-giants were drowned but one, who survived only by builiding an ark for himself and his familly. Bor’s sons dragged Ymir’s immense body to the center of Ginnungagap, and from him they made the earth. Ymir’s blood became the sea, his bones became the rocks and crags, and his hair became the trees. Bor’s sons took Ymir’s skull and with it made the sky. In it they fixed sparks and molten slag from Muspell to make the stars, and other sparks they set to move in paths just below the sky. They threw Ymir’s brains into the sky and made the clouds. The earth is a disk, and they set up Ymir’s eyelashes to keep the giants at the edges of that disk. On the sea shore, Bor’s sons found two logs and made people out of them. One son gave them breath and life, the second son gave them consciousness and movement, and the third gave them faces, speech, hearing, and sight. From this man and woman came all humans thereafter, just as all the gods were descended from the sons of Bor. Odin and his brothers had set up the sky and stars, but otherwise they left the heavens unlit. Long afterwards, one of the descendants of those first two people that the brothers created had two children. Those two children were so beautiful that their father named the son Moon and the daughter Sol. The gods were jealous already and, when they heard of the father’s arrogance, they pulled the brother and sister up to the sky and set them to work. Sol drives the chariot that carries the sun across the skies, and she drives so fast across the skies of the northland because she is chased by a giant wolf each day. Moon likewise takes a course across the sky each night, but not so swiftly because he is not so harried. In Norse mythology, Ymir is the primordial giant and the progenitor of the race of frost giants. He was created from the melting ice of Niflheim, when it came in contact with the hot air from Muspell. From Ymir’s sleeping body the first giants sprang forth: one of his legs fathered a son on his other leg while from under his armpit a man and women grew out. The frost kept melting and from the drops the divine cow Audumla was created. From her udder flowed four rivers of milk, on which Ymir fed. The cow itself got nourishment by licking hoar frost and salt from the ice. On the evening on the first day the hair of a man appeared, on the second day the whole head and on the third day it became a man, Buri, the first god. His grandchildren are Odin, Ve and Vili. Odin and his brothers had no liking for Ymir, nor for the growing number of giants, and killed him. In the huge amount of blood that flowed from Ymir’s wounds all the giants, except two, drowned. From the slain body the brothers created heaven and earth. They used the flesh to fill the Ginnungagap; his blood to create the lakes and the seas; from his unbroken bones they made the mountains; the giant’s teeth and the fragments of his shattered bones became rocks and boulders and stones; trees were made from his hair, and the clouds from his brains. Odin and his brothers raised Ymir’s skull and made the sky from it and beneath its four corners they placed a dwarf. Finally, from Ymir’s eyebrow they shaped Midgard, the realm of man. The maggots which swarmed in Ymir’s flesh they gave wits and the shape of men, but they live under the hills and mountains. They are called dwarfs. 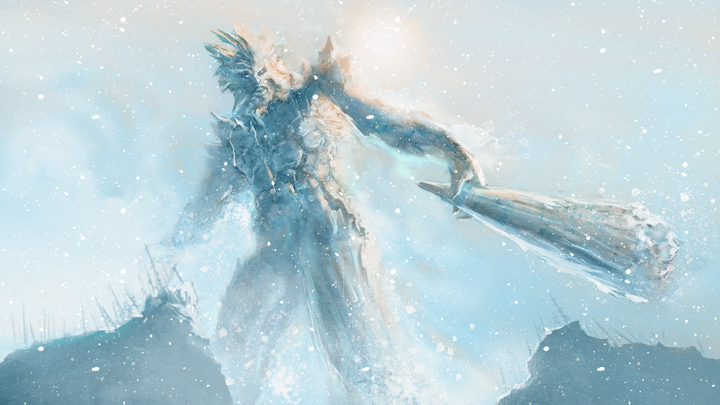 Ymir (also known as Ymer or Yme) was a frost Giant and the largest creature that has ever existed. He was created from the ice of Niflheim and heat of Muspellsheim. While he slept, smaller frost giants spawned from his body forming the Jotnar race. A male and a female spawned from the sweat of his left armpit, and a six-headed son was conceived by his two feet. When you look into the sky, what you see is the inside of Ymir’s skull which the Gods placed as a dome over their creation. The clouds are pieces of his brain, the mountains are made from his bones, the earth from his flesh, the trees from his hair and the sea from his blood. I made the surface of his body less smooth than I usually make my characters, as his main function in the story is being building material, therefore I wanted him to look a little bit “unfinished”.